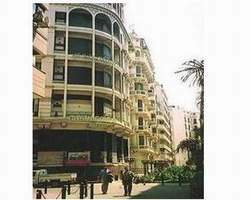 Cosmopolitan Hotel Cairo is located conveniently and well connected to all the parts of the city. The hotel due to its location is suitable for the business and the leisure travelers. The hotel offers cozy accommodation and warm services for the guests. The Cosmopolitan Hotel offers clean and air-conditioned single and double bedrooms as well as six suites, all of them simple but stylishly furnished and equipped with private bath, telephone and TV.Hotel offers 100 renovated rooms are equipped with all modern facilities. Cosmopolitan Hotel Cairo offers warm services and modern amenities for the guests. The hotel is located centrally and attracts both the business and the leisure travelers. The stay at the hotel would enable the guests to enjoy the hospitality and the tourist attractions of the area. The hotel amenities and services at Cosmopolitan Hotel Cairo includes restaurant, cafe, bar, 24 hour room service, laundry, travel assistance, bank, sauna, business center, swimming pool, etc. The other amenities and services include cafeteria, King's bar and the patisserie Le Moulin. The restaurant in the hotel serves breakfast and other meals upon request. Moreover the guest can also visit the many restaurants nearby that serve different cuisines. The business center at Cosmopolitan Hotel Cairo helps the business travelers to meet their needs with the required facilities. The features include fax and other facilities to help the business travelers.